In the context menu of an individual document. 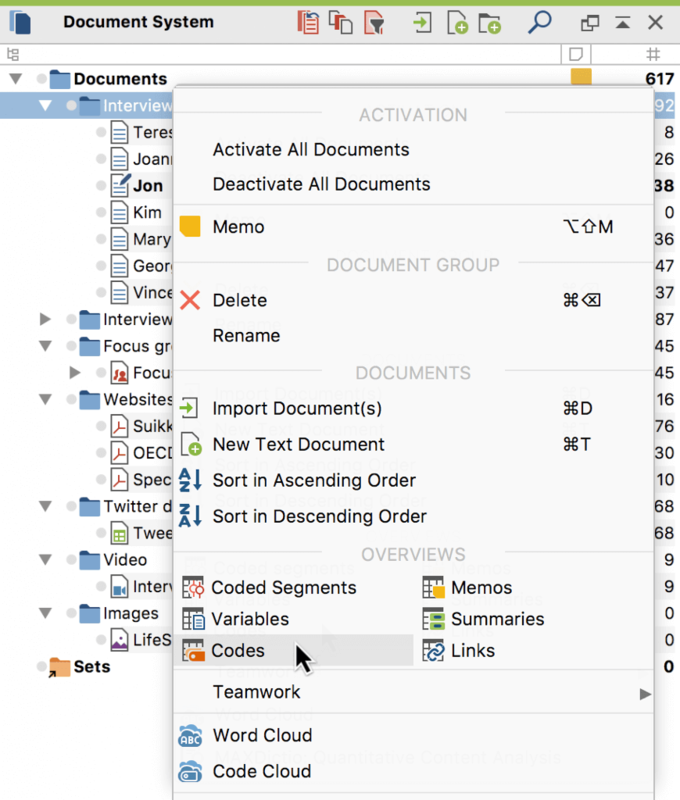 A table view of all of the codes that occur in the relevant documents will appear. The table may contain more or fewer lines depending on the place in the program from which it was called up. In the title of the overview you can see which documents the overview applies to and to how many (different) codes in the document a segment is assigned. Please note: When the “Overview of Codes” is opened in the Reports tabit contains also codes to which no coded segment is assigned. Otherwise, only codes to which at least one coded segment is assigned in the relevant document will be displayed. Parent code – Here the parent code is displayed for the easier assignment of codes. If the “Parent code” column is empty, the code in this row belongs to the top level of the code system. Coded segments of all documents – The number of segments in the analyzed documents that have been coded with a particular code or subcode. Coded segments of activated documents – Takes only activated documents into account. If this column displays all zeros, then presumably because no documents are selected. Once you can activate documents, you can directly observe how the values in this column change. % Coded segments of all documents – The share of segments that have been coded with the particular code or subcode, in relation to the total number of coded segments in column “All coded segments”. The sum of the column is 100%. % Coded segments of activated documents – As in the “All coded segments %” column, but takes only activated documents into account. Code alias – Alternative name for a code with up to 255 characters, that e.g. may be exported in the Smart Publisher report instead of the code name itself. Right-clicking a row opens a context menu with various options, you can open the Overview of coded segments or Overview of linked memos, for example. You can also change the color attribute of a code from this menu. Aggregate on 1st level – Only the codes at the top level of the code system will be displayed. Here, the code frequencies of the subcodes are added, as well as the number of documents in which the code occurs.